Stippling consists of multiple punctate abrasions of the skin due to the impact of small fragments of foreign material. If this material is gunpowder, the author calls this form of stippling powder tattooing. If the material is not powder, but the punctate abrasions produced appear identical to those due to powder, the phenomena is referred to as pseudo-powder tattooing. Most stippling of a non-gunpowder origin does not resemble powder tattooing and can easily be differentiated from it. The exception is stippling from shotgun filler. Figure 4.33 (A) Irregular stippling of skin due to fragments of glass; (B) fine stipple marks due to fragments of glass. may reveal minute fragments of glass embedded in the tip. High-velocity bullets striking glass may break up, showering the individual not only with glass fragments but also with fragments of the core and metal jacketing. Thus, the stippling marks may be due not only to the glass but to the fragments of the bullet (see Figure 4.32). A bullet ricocheting off a hard surface can generate secondary fragments that may produce stippling of the skin. These marks can be due to fragments of wood or stone from the surface from which the bullet ricocheted or to metal fragments from the bullet itself. Such markings are usually larger, more irregular, and considerably more sparse than powder tattoo marks. Fragments of wood or metal often will be found embedded in or adjacent to these markings. Stippling can be produced by fragments of the plastic casing used to enclose the shot in handgun shot cartridges. The fragment marks are usually very large and irregular (see Figure 10.17). Occasionally, individuals construct crude silencers, using steel wool as the packing material in the silencer. On firing the weapon, fragments of the steel wool may be propelled out the end of the silencer, embedding themselves in the skin around the entrance. These markings are relatively sparse and fragments of the steel wool often can be found embedded in the skin. Postmortem insect activity may produce lesions on the skin that resemble powder stippling (Figure 4.34A). These lesions, however, are larger, more irregular, and usually have a dry, yellow color to them. They often are arranged in a linear pattern, indicating the feeding path of the insects across the body. Fresh wounds may ooze serosanguineous fluid that on drying forms a dark brown or black crust that may cause the insect bites to more closely resemble powder tattoo marks. 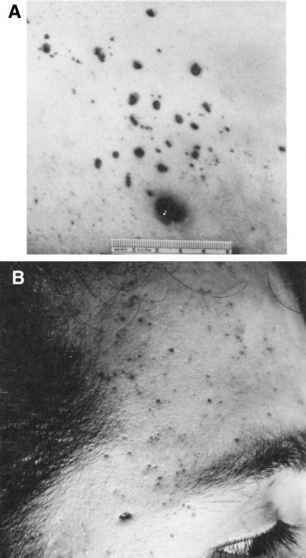 Gunshot wounds in hairy areas may result in hemorrhage in hair follicles (Figure 4.34B). If the hair is shaved from the area of the wound, a cursory examination of the skin surrounding the entrance may cause the examiner to interpret the hemorrhage in the follicles as powder tattoo marks. Closer examination, however, will reveal the true nature of the markings. Occasionally surgical manipulation of a wound may produce markings that simulate powder tattoo marks. In the case illustrated, the wound was sutured closed by a surgeon (Figure 4.34C). When the sutures were removed, the needle puncture marks were interpreted by a number of individuals as powder tattoo marks. 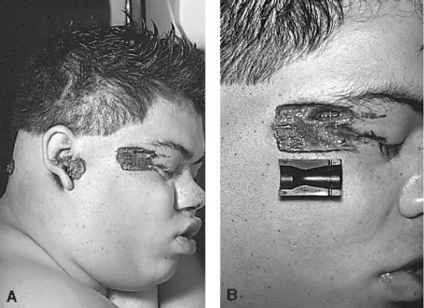 One of the more unusual cases of lesions simulating powder tattooing involved a young boy who after shooting himself in the head survived a short time at a hospital. At autopsy, "powder tattoo marks" were seen on the flexor surface of the left forearm. Because the weapon was a bolt-action rifle, such tattooing could not have occurred. Subsequent investigation revealed the deceased had had a tourniquet placed on his arm when seen in the emergency room. This tourniquet was never removed. Close examination of the markings on the skin, originally interpreted as tattoo marks, revealed them to be petechiae. 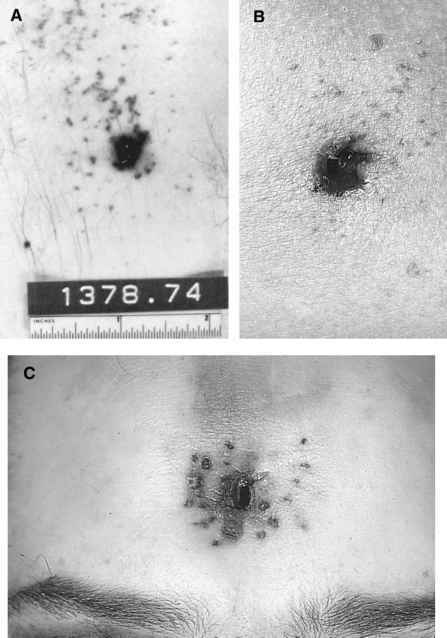 Figure 4.34 (A) Postmortem insect bites around gunshot wound of entrance; (B) hemorrhage into hair follicles simulating powder tattooing; (C) suture marks simulating powder tattoo marks.